Be recognized for your specialization area. I had a table for Rec Therapy Today at the North Carolina Recreational Therapy Association. Someone placed NCTRC specialty certification brochures on my table when I was in a session. The brochure is a bit outdated. NCTRC has moved away from advanced specialty certification to having a specialty recognition areas of recognition as a branch of the CTRS credential. 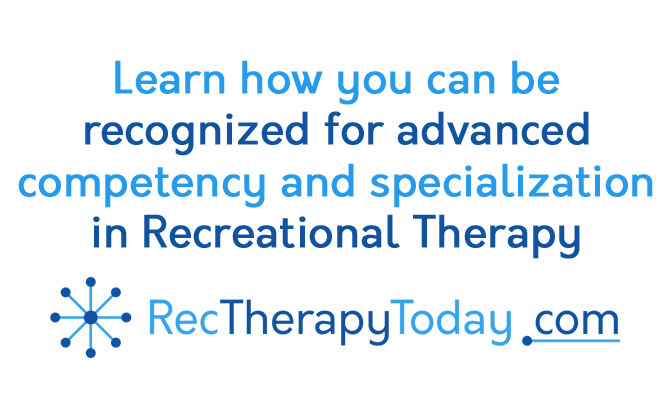 Recreational therapists with the CTRS credential can be recognized for having advanced training and education in one (or more) of these specialization areas. Specialty can be earned by having worked at least five years in the specialization area and having 75 hours of continuing education (focused in the specialization area). Danny Pettry: I do my best to serve as a role model for other recreational therapists. I’m a Certified Therapeutic Recreation Specialist (CTRS) with the Behavioral Health specialization. As a disclaimer: contact NCTRC for official information.